The Awards SIG (Special Interest Group) is designed to recognize those members who have successfully observed the required objects for the various certificates. The CCD SIG was established to provide a forum for JSCAS members interested in building or just using CCD cameras for astro-imaging. There are at least five current JSCAS members who have built their own Cookbook CCD cameras and at least two others who have bought cameras and regularly use them to make images. This group includes some of the most experienced and published amateur CCD imagers in the world, including three of the co-authors of a recent article in Sky and Telescope Magazine (December 1998) which documented a well-received breakthrough in color imaging, and two of the chapter authors in the recently published Springer-Verlag book entitled AMATEUR TELESCOPE MAKING. SIG members are always willing to assist others wishing to learn about building, buying, and using CCD cameras and processing the resulting image data. For additional information, contact Al Kelly. Click on images for full size image. 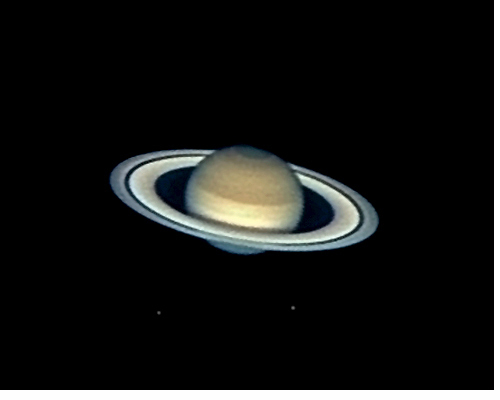 This image of Saturn is an"LRGB" taken with a C14 at f/60 using a 10 mm projection eyepiece and a ST6 CCD. Taken from Houston Texas on 11/07/99 by Ed Grafton. WCMY color CCD image of M17 (the Omega Nebula) made from images taken on 7/25/98 by Al Kelly with a C-8 at f5.6 from Friendswood, Texas. The IR- filtered, cyan, magenta, and yellow exposures were stacked totals of 9, 10, 8, and 7 minutes respectively. WCMY image of planetary nebula NGC1501, taken by Al Kelly and Ed Grafton on 12/19/98 with CB245 and 32" f4 Newtonian from Danciger, Texas. twenty 15- second subexposures in cyan, sixteen 15-second subexposures in magenta, and twelve 15-second subexposures in yellow were combined with twenty-two 15- second subexposures in white (IR-filtered only). For more beautiful images; check out Al Kelly's CCD PAGE!!! or Ed Grafton's CCD PAGE!!! The wonders of deep space are open to those with a telescope, binoculars or just plain eyes. Take a tour of the heavens with our monthly Observing program. Visit wispy nebulas, eye-catching clusters, distant galaxies, and solar system objects. Each month objects are selected for your viewing pleasure. These objects will be featured in the Starscan and presented at our monthly meetings. Interesting facts will be given about selected object. The Astronomy Fundaments SIG is designed to aid new and veteran observers in the basics of astronomy. The Amateur Telescope Making SIG was established some years back when Al Kelly coordinated the efforts of about twenty club members in a mass telescope building program. Al designed a telescope that anyone, with just a bit of tool knowledge, could assemble. A second round of construction was started about a year latter and another twenty scopes were born. Several members of our club have produced their own mirrors and are well versed enough to teach others the process. Mirrors from 4.25" to 22" have been made by hand and machine by the more insane of the bunch. Mirror making questions made be forwarded to Bob Taylor.